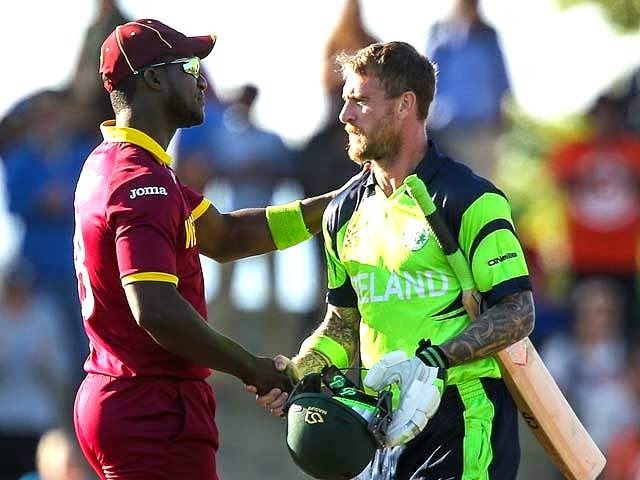 West Indies batsman Darren Sammy and Ireland bowler John Mooney were both fined 30 percent of their match fees for swearing during Monday's World Cup clash in Nelson. Sammy was heard on television screens using inappropriate words after playing a shot in the 34th over of the West Indies innings. Mooney swore several times when a fielder dropped a catch in the 45th over at Saxton Oval. They were fined under the International Cricket Council's code of conduct, which relates to "language or a gesture that is obscene, offensive or insulting during an International match", following Ireland's four-wicket victory. "Both players admitted the offences and accepted the sanction proposed by match referee Chris Broad. As such, there was no need for a formal hearing," said an ICC statement. Sammy, who made 89 during West Indies' innings, said: "I'd just like to apologise to the viewers for that, especially the young kids listening."